Definition at line 44 of file tcpcore.h. Definition at line 43 of file tcpcore.h. Definition at line 45 of file tcpcore.h. Definition at line 251 of file tcpcore.h. Definition at line 1667 of file tcpcore.h. Definition at line 1668 of file tcpcore.h. Definition at line 1666 of file tcpcore.h. Definition at line 1680 of file tcpcore.h. Definition at line 1816 of file tcpcore.h. Definition at line 2869 of file tcpcore.h. Definition at line 40 of file tcpcore.h. Definition at line 39 of file tcpcore.h. Definition at line 118 of file tcpcore.h. Definition at line 2069 of file tcpcore.h. Definition at line 2156 of file tcpcore.h. Definition at line 2154 of file tcpcore.h. Definition at line 2155 of file tcpcore.h. Definition at line 2157 of file tcpcore.h. Definition at line 2075 of file tcpcore.h. Definition at line 93 of file tcpcore.h. Definition at line 1664 of file tcpcore.h. Definition at line 231 of file tcpcore.h. Definition at line 230 of file tcpcore.h. Definition at line 47 of file tcpcore.h. Definition at line 768 of file tcpcore.h. Definition at line 769 of file tcpcore.h. Definition at line 50 of file tcpcore.h. Definition at line 49 of file tcpcore.h. Definition at line 48 of file tcpcore.h. Definition at line 767 of file tcpcore.h. Definition at line 1142 of file tcpcore.h. Definition at line 256 of file tcpcore.h. Definition at line 41 of file tcpcore.h. Definition at line 2140 of file tcpcore.h. Definition at line 1926 of file tcpcore.h. Definition at line 1928 of file tcpcore.h. Definition at line 3849 of file tcpcore.h. Definition at line 2018 of file tcpcore.h. Definition at line 1815 of file tcpcore.h. Definition at line 2134 of file tcpcore.h. Definition at line 2139 of file tcpcore.h. Definition at line 1925 of file tcpcore.h. Definition at line 1927 of file tcpcore.h. Definition at line 2084 of file tcpcore.h. Definition at line 2127 of file tcpcore.h. Definition at line 2353 of file tcpcore.h. Definition at line 2036 of file tcpcore.h. Definition at line 2043 of file tcpcore.h. Definition at line 2152 of file tcpcore.h. Definition at line 2151 of file tcpcore.h. Definition at line 2150 of file tcpcore.h. Definition at line 1930 of file tcpcore.h. Definition at line 1931 of file tcpcore.h. Definition at line 1932 of file tcpcore.h. Definition at line 1842 of file tcpcore.h. Definition at line 1929 of file tcpcore.h. Definition at line 2090 of file tcpcore.h. Definition at line 2087 of file tcpcore.h. Definition at line 3641 of file tcpcore.h. Definition at line 2078 of file tcpcore.h. Definition at line 2081 of file tcpcore.h. Definition at line 2341 of file tcpcore.h. Definition at line 2342 of file tcpcore.h. * socket. 7 is ~50sec-16min. Definition at line 2118 of file tcpcore.h. Definition at line 2166 of file tcpcore.h. * provided by timewait state. Definition at line 2167 of file tcpcore.h. Definition at line 2173 of file tcpcore.h. Definition at line 1933 of file tcpcore.h. Definition at line 2146 of file tcpcore.h. * to ~3sec-8min depending on RTO. Definition at line 2097 of file tcpcore.h. * 90 minutes to time out. * RFC1122 says that the limit is 100 sec. * 15 is ~13-30min depending on RTO. Definition at line 2104 of file tcpcore.h. Definition at line 2142 of file tcpcore.h. Definition at line 2143 of file tcpcore.h. Definition at line 2867 of file tcpcore.h. Definition at line 2111 of file tcpcore.h. Definition at line 2114 of file tcpcore.h. Definition at line 2164 of file tcpcore.h. Definition at line 2163 of file tcpcore.h. Definition at line 2239 of file tcpcore.h. Definition at line 2241 of file tcpcore.h. Definition at line 2240 of file tcpcore.h. Definition at line 2238 of file tcpcore.h. Definition at line 2815 of file tcpcore.h. Definition at line 2144 of file tcpcore.h. Definition at line 2123 of file tcpcore.h. Definition at line 2179 of file tcpcore.h. Definition at line 2178 of file tcpcore.h. Definition at line 2206 of file tcpcore.h. Definition at line 2161 of file tcpcore.h. Definition at line 2160 of file tcpcore.h. Definition at line 2094 of file tcpcore.h. Definition at line 2095 of file tcpcore.h. Definition at line 2093 of file tcpcore.h. Definition at line 2035 of file tcpcore.h. Definition at line 2861 of file tcpcore.h. Definition at line 2856 of file tcpcore.h. Definition at line 2845 of file tcpcore.h. Definition at line 2848 of file tcpcore.h. Definition at line 2847 of file tcpcore.h. Definition at line 2841 of file tcpcore.h. Definition at line 2844 of file tcpcore.h. Definition at line 2843 of file tcpcore.h. Definition at line 2842 of file tcpcore.h. Definition at line 2846 of file tcpcore.h. Definition at line 2853 of file tcpcore.h. Definition at line 2857 of file tcpcore.h. Definition at line 2851 of file tcpcore.h. Definition at line 2852 of file tcpcore.h. Definition at line 2854 of file tcpcore.h. Definition at line 2859 of file tcpcore.h. Definition at line 2225 of file tcpcore.h. Definition at line 2234 of file tcpcore.h. Definition at line 2235 of file tcpcore.h. Definition at line 2236 of file tcpcore.h. Definition at line 2227 of file tcpcore.h. Definition at line 2233 of file tcpcore.h. Definition at line 2228 of file tcpcore.h. Definition at line 2231 of file tcpcore.h. Definition at line 2226 of file tcpcore.h. Definition at line 2232 of file tcpcore.h. Definition at line 2214 of file tcpcore.h. Definition at line 2215 of file tcpcore.h. Definition at line 2213 of file tcpcore.h. Definition at line 2218 of file tcpcore.h. Definition at line 2217 of file tcpcore.h. Definition at line 2219 of file tcpcore.h. Definition at line 2216 of file tcpcore.h. Definition at line 2639 of file tcpcore.h. Definition at line 120 of file tcpcore.h. Definition at line 2473 of file tcpcore.h. Definition at line 2510 of file tcpcore.h. Referenced by __pskb_trim(), and __skb_trim(). Allocate a new &sk_buff and assign it a usage count of one. The buffer has unspecified headroom built in. Users should allocate the headroom they think they need without accounting for the built in space. The built in space is used for optimisations. NULL is returned in there is no free memory. Definition at line 1045 of file tcpcore.h. Referenced by kfree_skb(), tcp_alloc_pskb(), and tcp_free_skb(). Definition at line 869 of file tcpcore.h. Referenced by __pskb_pull(), and pskb_may_pull(). Definition at line 962 of file tcpcore.h. Definition at line 647 of file tcpcore.h. Remove the head of the list. This function does not take any locks so must be used with appropriate locks held only. The head item is returned or NULL if the list is empty. Definition at line 568 of file tcpcore.h. Referenced by __skb_queue_purge(), skb_dequeue(), tcp_prequeue(), and tcp_writequeue_purge(). Remove the tail of the list. This function does not take any locks so must be used with appropriate locks held only. The tail item is returned or NULL if the list is empty. Definition at line 729 of file tcpcore.h. Definition at line 612 of file tcpcore.h. Referenced by __skb_append(), and skb_insert(). Definition at line 841 of file tcpcore.h. Definition at line 810 of file tcpcore.h. Definition at line 775 of file tcpcore.h. Queue a buffer at the start of a list. This function takes no locks and you must therefore hold required locks before calling it. A buffer cannot be placed on two lists at the same time. Definition at line 476 of file tcpcore.h. Delete all buffers on an &sk_buff list. Each buffer is removed from the list and one reference dropped. This function does not take the list lock and the caller must hold the relevant locks to use it. Definition at line 1025 of file tcpcore.h. Queue a buffer at the end of a list. This function takes no locks and you must therefore hold required locks before calling it. Definition at line 524 of file tcpcore.h. Referenced by skb_queue_tail(), and tcp_prequeue(). Definition at line 935 of file tcpcore.h. Definition at line 677 of file tcpcore.h. Referenced by __skb_dequeue_tail(), and skb_unlink(). Definition at line 3197 of file tcpcore.h. Definition at line 2988 of file tcpcore.h. Definition at line 2759 of file tcpcore.h. Definition at line 3126 of file tcpcore.h. Definition at line 2419 of file tcpcore.h. Referenced by adns__makefinal_block(), adns__makefinal_str(), af_glyph_hints_align_strong_points(), af_latin_hint_edges(), call_test(), FT_List_Insert(), FT_List_Remove(), FT_List_Up(), TrayNotifyDlg::InsertItem(), psh_glyph_compute_extrema(), psh_glyph_compute_inflections(), psh_glyph_interpolate_normal_points(), sanity_check(), T1_Set_MM_Design(), tcp_minshall_check(), tcp_snd_test(), test_AbortWaitCts(), test_LoopbackRead(), test_QueueUserWorkItem(), test_read_write(), test_ReadTimeOut(), test_WaitBreak(), test_WaitCommEvent(), test_WaitCts(), test_WaitDcd(), test_WaitDsr(), test_WaitRing(), test_WaitRx(), and test_waittxempty(). 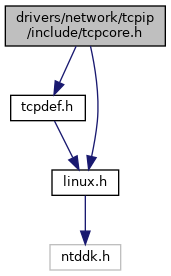 Referenced by __dev_alloc_skb(), and tcp_alloc_pskb(). Definition at line 2414 of file tcpcore.h. Referenced by adns__makefinal_block(), adns__makefinal_str(), af_glyph_hints_align_strong_points(), af_latin_hint_edges(), call_test(), else_break(), FT_List_Add(), FT_List_Remove(), FT_List_Up(), HTMLSelectElement_add(), LexcmpTest::lexcmp1(), LexcmpTest::lexcmp2(), psh_glyph_compute_extrema(), psh_glyph_compute_inflections(), psh_glyph_interpolate_normal_points(), sanity_check(), T1_Set_MM_Design(), test_AbortWaitCts(), test_LoopbackRead(), test_QueueUserWorkItem(), test_read_write(), test_ReadTimeOut(), test_WaitBreak(), test_WaitCommEvent(), test_WaitCts(), test_WaitDcd(), test_WaitDsr(), test_WaitRing(), test_WaitRx(), test_waittxempty(), and TEXT_NextLineW(). Definition at line 2426 of file tcpcore.h. NULL is returned in there is no free memory. Although this function allocates memory it can be called from an interrupt. Definition at line 1069 of file tcpcore.h. Definition at line 3789 of file tcpcore.h. Definition at line 3798 of file tcpcore.h. Drop a reference to the buffer and free it if the usage count has hit zero. Definition at line 297 of file tcpcore.h. Referenced by __skb_queue_purge(), skb_queue_purge(), skb_share_check(), and skb_unshare(). Definition at line 304 of file tcpcore.h. Definition at line 1117 of file tcpcore.h. Definition at line 1132 of file tcpcore.h. Definition at line 885 of file tcpcore.h. Definition at line 878 of file tcpcore.h. Definition at line 973 of file tcpcore.h. Place a packet after a given packet in a list. The list locks are taken and this function is atomic with respect to other list locked calls. A buffer cannot be placed on two lists at the same time. Definition at line 663 of file tcpcore.h. Returns true if the buffer was generated with skb_clone() and is one of multiple shared copies of the buffer. Cloned buffers are shared data so must not be written to under normal circumstances. Definition at line 319 of file tcpcore.h. Referenced by skb_cow(), and skb_unshare(). If the skb passed lacks sufficient headroom or its data part is shared, data is reallocated. If reallocation fails, an error is returned and original skb is not changed. The result is skb with writable area skb->head...skb->tail and at least @headroom of space at head. Definition at line 1092 of file tcpcore.h. Remove the head of the list. The list lock is taken so the function may be used safely with other locking list functions. The head item is returned or NULL if the list is empty. Definition at line 597 of file tcpcore.h. Remove the head of the list. The list lock is taken so the function may be used safely with other locking list functions. The tail item is returned or NULL if the list is empty. Definition at line 746 of file tcpcore.h. Makes another reference to a socket buffer and returns a pointer to the buffer. Definition at line 278 of file tcpcore.h. Definition at line 762 of file tcpcore.h. Return the number of bytes of free space at the head of an &sk_buff. Definition at line 901 of file tcpcore.h. Place a packet before a given packet in a list. The list locks are taken and this function is atomic with respect to other list locked calls A buffer cannot be placed on two lists at the same time. Definition at line 634 of file tcpcore.h. Definition at line 757 of file tcpcore.h. If there is no free memory -ENOMEM is returned, otherwise zero is returned and the old skb data released. If a buffer currently has an owner then we call the owner's destructor function and make the @skb unowned. The buffer continues to exist but is no longer charged to its former owner. Definition at line 990 of file tcpcore.h. Peek an &sk_buff. Unlike most other operations you MUST be careful with this one. A peek leaves the buffer on the list and someone else may run off with it. You must hold the appropriate locks or have a private queue to do this. Returns NULL for an empty list or a pointer to the head element. The reference count is not incremented and the reference is therefore volatile. Use with caution. Definition at line 408 of file tcpcore.h. Returns NULL for an empty list or a pointer to the tail element. The reference count is not incremented and the reference is therefore volatile. Use with caution. Definition at line 430 of file tcpcore.h. This function removes data from the start of a buffer, returning the memory to the headroom. A pointer to the next data in the buffer is returned. Once the data has been pulled future pushes will overwrite the old data. Definition at line 860 of file tcpcore.h. This function extends the used data area of the buffer at the buffer start. If this would exceed the total buffer headroom the kernel will panic. A pointer to the first byte of the extra data is returned. Definition at line 827 of file tcpcore.h. This function extends the used data area of the buffer. If this would exceed the total buffer size the kernel will panic. A pointer to the first byte of the extra data is returned. Definition at line 794 of file tcpcore.h. Returns true if the queue is empty, false otherwise. Definition at line 265 of file tcpcore.h. Queue a buffer at the start of the list. This function takes the list lock and can be used safely with other locking &sk_buff functions safely. Definition at line 503 of file tcpcore.h. Definition at line 450 of file tcpcore.h. Return the length of an &sk_buff queue. Definition at line 445 of file tcpcore.h. Referenced by tcp_fast_path_check(), and tcp_prequeue(). Delete all buffers on an &sk_buff list. Each buffer is removed from the list and one reference dropped. This function takes the list lock and is atomic with respect to other list locking functions. Definition at line 1008 of file tcpcore.h. Queue a buffer at the tail of the list. This function takes the list lock and can be used safely with other locking &sk_buff functions safely. Definition at line 550 of file tcpcore.h. Increase the headroom of an empty &sk_buff by reducing the tail room. This is only allowed for an empty buffer. Definition at line 927 of file tcpcore.h. If the buffer is shared the buffer is cloned and the old copy drops a reference. A new clone with a single reference is returned. If the buffer is not shared the original buffer is returned. When being called from interrupt status or with spinlocks held pri must be GFP_ATOMIC. NULL is returned on a memory allocation failure. Definition at line 351 of file tcpcore.h. Returns true if more than one person has a reference to this buffer. Definition at line 332 of file tcpcore.h. Definition at line 913 of file tcpcore.h. Cut the length of a buffer down by removing data from the tail. If the buffer is already under the length specified it is not modified. Definition at line 954 of file tcpcore.h. Works even without knowing the list it is sitting on, which can be handy at times. It also means that THE LIST MUST EXIST when you unlink. Thus a list must have its contents unlinked before it is destroyed. Definition at line 704 of file tcpcore.h. Definition at line 384 of file tcpcore.h. Definition at line 3507 of file tcpcore.h. Definition at line 3514 of file tcpcore.h. Definition at line 3523 of file tcpcore.h. Definition at line 3500 of file tcpcore.h. Definition at line 2485 of file tcpcore.h. Definition at line 3724 of file tcpcore.h. Definition at line 3692 of file tcpcore.h. Definition at line 3715 of file tcpcore.h. Definition at line 1943 of file tcpcore.h. Definition at line 3336 of file tcpcore.h. Definition at line 3653 of file tcpcore.h. Definition at line 3105 of file tcpcore.h. Definition at line 3206 of file tcpcore.h. Definition at line 2505 of file tcpcore.h. Definition at line 2644 of file tcpcore.h. Definition at line 2718 of file tcpcore.h. Referenced by tcp_may_send_now(), and tcp_push_pending_frames(). Definition at line 2942 of file tcpcore.h. Definition at line 2969 of file tcpcore.h. Definition at line 2490 of file tcpcore.h. Definition at line 2500 of file tcpcore.h. Definition at line 3312 of file tcpcore.h. Definition at line 3002 of file tcpcore.h. Definition at line 3672 of file tcpcore.h. Referenced by tcp_alloc_page(), and tcp_alloc_pskb(). Definition at line 2775 of file tcpcore.h. Definition at line 2768 of file tcpcore.h. Definition at line 3807 of file tcpcore.h. Definition at line 3643 of file tcpcore.h. Definition at line 3491 of file tcpcore.h. Definition at line 3166 of file tcpcore.h. Definition at line 2745 of file tcpcore.h. Definition at line 2051 of file tcpcore.h. Definition at line 3771 of file tcpcore.h. Definition at line 3781 of file tcpcore.h. Definition at line 3018 of file tcpcore.h. Definition at line 3153 of file tcpcore.h. Definition at line 3664 of file tcpcore.h. Definition at line 2882 of file tcpcore.h. Definition at line 3023 of file tcpcore.h. Definition at line 3033 of file tcpcore.h. Definition at line 3682 of file tcpcore.h. Definition at line 3050 of file tcpcore.h. Definition at line 2344 of file tcpcore.h. Definition at line 3622 of file tcpcore.h. Definition at line 2915 of file tcpcore.h. Referenced by __tcp_enter_cwr(), and tcp_snd_test(). Definition at line 3821 of file tcpcore.h. 3831 "their cleanup function should take precedence over timestamps." 3834 out-of-sync and half-open connections will not be reset. 3837 via reboots. Linux-2.2 DOES NOT! 3839 However, we can relax time bounds for RST segments to MSL. Definition at line 3236 of file tcpcore.h. Definition at line 3218 of file tcpcore.h. Definition at line 3145 of file tcpcore.h. Definition at line 2929 of file tcpcore.h. Definition at line 2790 of file tcpcore.h. Definition at line 2680 of file tcpcore.h. Referenced by tcp_check_probe_timer(), and tcp_prequeue(). Definition at line 3327 of file tcpcore.h. Definition at line 2480 of file tcpcore.h. Definition at line 3415 of file tcpcore.h.